I received this question as a comment on another question, but I though that it was a good enough to expand upon. Patches of bare earth is a common complaint with lawns. I have a lawn that is not the best quality but in the past has been hard wearing. The lawn is open to three dogs. I have now patches of the lawn where the earth has come through and there is no sign of grass. I have watered the lawn a few times and have done letting it grow or cutting it back. But I still have these patches of earth where the grass is not growing back into. What am I to do? I have tried patch repair kits to little or no success. I can rope the lawn of if necessary to try to keep the dogs of it but I desperately need advice. Thanks for your question. It sounds like your lawn is very well used. Lawns which have dogs running about on them are often compacted. This means that the soil particles have been squashed together so much that air, water and grass roots cannot penetrate it. The soil becomes dead and hard. Sowing seed or watering seems to have no effect. You can do a simple compaction test by using a stick or garden fork. Try to drive it into the soil in the affected area. If it is solid, or very difficult to penetrate into then it is compacted and will need to be fixed. 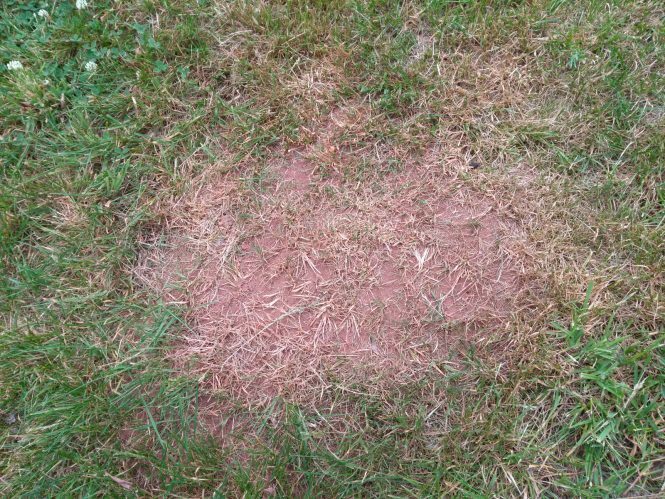 How do you fix patches of bare earth in lawns? The first thing you must do when trying to fix difficult, compacted areas of lawn is to aerate the soil. I would use a heavy machine called a hollow-tine aerator. You can use a more traditional spade and fork. To do this give the lawn a good watering first and let it soak in for a few minutes. Then dig up the area with a fork. You can be quite aggressive. The aim is to break up the clods and get air into the soil. Once you have done this smooth the area over with a rake and you can then re-seed with fresh grass seed. Once you have broken up the soil it will be much easier for any grass seed to put down a root. The grass will then grow strongly and hopefully blend into the rest of the lawn. Keep it roped off from your dogs and the lawn will then do well. Keeping your lawn regularly aerated is one of the most important jobs you can do to for your lawn. I hope this is helpful, thanks for reading! P.S. Main image is a stock image from my own lawn care photos and not of the readers lawn. Once I have broken up the soil is it worth me putting down new top soil on those patches with nes seed? Yes, some fresh topsoil would certainly be beneficial and help put some life into the soil.